Do whatever u want but i want to have a possibility to play for green peasant. How do you like new Russian jersey? Haha, good job mate!! Shirt looks great! It's not just close enough, it's perfect! GaDo1 wrote: Haha, good job mate!! Shirt looks great! :DIt's not just close enough, it's perfect! What features could still be added? *our coordinates on loadscreen ("Clan FOOT, Northrend, <forum URL>") - graphical or plain text? Reply quick, we don't have much time! This way, I have weeded out the bad, and kept the good. I'm not going to convince you of why because I have done that many times. So I will only say this: if these changes were implemented this exact way I think most players would be pleased, as opposed to the current situation. If not, I feel this community will never reach its full potential which is a real shame after all the positive progress that has been achieved so far. Therefore, the advice is there and only you have the power to do what's best or you can do what you personally feel is best. Whether you do this or not will probably decide the future of this community. Good day. Hey, just wanted to mention that all these last-minute changes are optional. We don't have to make the banner thing, or the loadscreen with clan foot on it (if someone's, that would be shine's job). And I've noticed about jerseys that they are excessively detailed. Yes, excessively. It's great, and fantastic job vlad, but people won't be able to appreciate all the details on jerseys, because the game camera is just so far away from peasants/peons. In order to see the details, you have to zoom all your way in, which is only possible in -train mode, not in normal games. Therefore my advice would be: avoid unnecessary detail for the remaining jerseys (england/portugal, and maybe argentina/france). That would greatly reduce the file size and moreover ease your job, right? Btw, if we can't make argentina and france jerseys on time, it's alright, we can scrap them, because they can be safely removed from the voting. They are already "random" nations, "competing" for a button with netherlands/italy. 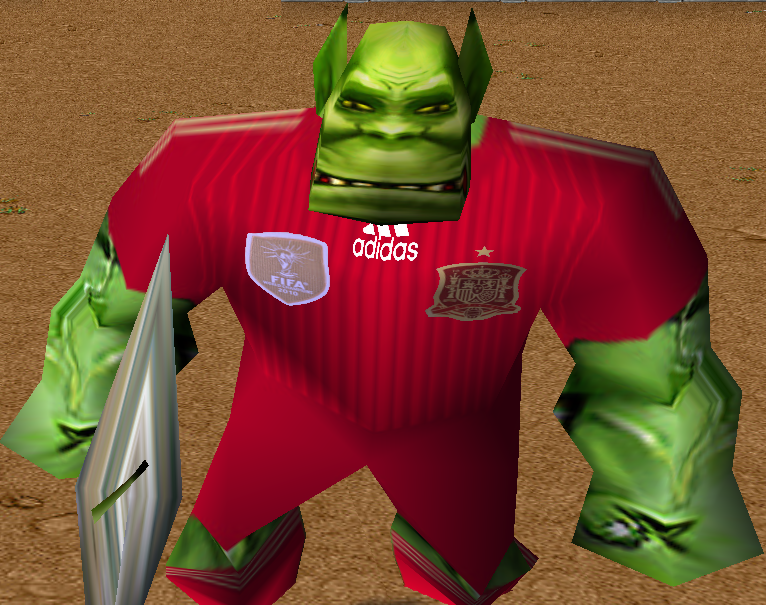 The only high detailed thing in those kits are crest textures with resolutions of 128x128 pixels. Next lower available resolution is 64x64, which is used for icons and is really too low to use for anything else. The only thing that would be easier to me if I used lower details is shorter time to google out images where I took crests from. 1. Key Space - fix the camera on the player. People often flies the camera and at this point you need to quickly point the camera at your player to continue playing. Space key will greatly facilitate this task! 2. Remove the possibility of losing control of the player. Even though it rare in the game, but agree accidentally pressing the left mouse button on the player to stranger can lead to loss of control of your player and spoil the game time! - What do you mean? What else shall i add? On the loading screen there it already says "Presented by clan KICK" and theres also the link of our forum. I think thats all we need. 2. I uploaded many golazo sounds here. Those are 18 different sound. Morgan added the sounds goal1 and goal6. But if you think, there should be more or different golazo sounds - then download them and post your favorites! To add more atmosphere sounds to the map, could be still optional changes. 4.The brazuca-ball has still not this kind of tail. I would recommend to add it for people, who want to play with da brazuca. If you check page 3, vlad has already made a model for it. That Version was why i got this idea. SO what are we going to do about this topic? What do the other people think? Vlad wrote: We should use it somehow, maybe a player with the best score should run with it in his hand around the map at the end of game? This could also be an optional change. So adding pointless features that I will never care about because my sound is always off is higher ranking than simplifying the game? Bring on the imba goalies and offsides penalties and then we can talk. Edit: I'm not asking for a whole lot (the offsides is kind of a joke but its still an idea). The imba goalies can honestly just step it up a notch and be able to kick the ball outside of the goal so clears and vz's can actually be defended instead of abused. [. ]B R [. ]A [. ]V [.]O! [.]! [.]! [.]! This is the world cup version. Of course we will have to make it make it as attractive as possible which also includes cool sounds. We wanna advertise the game! We can discuss about good gameplay features (if you have ideas) later on for our future private versions. C00LED wrote: So adding pointless features that I will never care about because my sound is always off is higher ranking than simplifying the game? 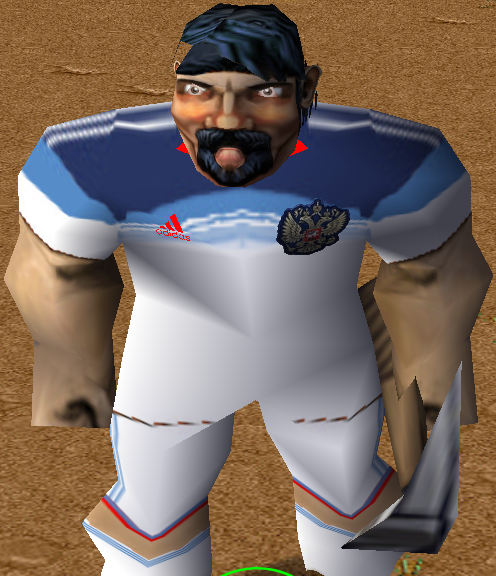 Everyone, don't forget to thank Vladimir for his magnificent jerseys/t-shirts, a feature that we've been craving for since many years ago. Hooray! Upload this version to the bot too, please. 1. Are all these features by default in the official version? Is there at least a way to deactivate it, so you can also play 10min, no cgoals, no curve, normal keepers and normal speed having the ball? Actually i would prefer that the gameplay stays as normal as it was usually, and that the mentioned features will only be enabled by the -easy mode. why dont we take this one instead? Or do i have to create something new instead? 3. I had the idea, that we change the message when someone scores a goal. It would be cool if it said "Bastian Schweinsteiger scored a goal" instead of "ShineXXX scored a goal". Can you do that? So that it always shows the player names instead of the account names? 4. In Englands Team there is still Theo Walcott who isnt participating in the world cup. Also Montolivo (Italy, im not sure if hes in your list) and Reus (Germany, injured) wont participate. My Suggestions for the replacement: Take Jack Wilshere (if hes not in the list already) or Phil Jagielka for England (except weeble/verve/magics want someone else), take Thiago Motta or Ciro Immobile for Italy (if montolivo was in your list, and except vegekou thinks someone else was better) and take Lukas Podolski instead of Marco Reus, please. btw have you also checked that there is no Strootman in the netherlands team? He also wont play. If you still havent removed him, take Nigel de Jong or Bruno Martins Indi, please. That one is a really bad idea. Before stadium from version 7.45 I was adapting some Red Bull Arena model and its canopies were blocking the pitch.